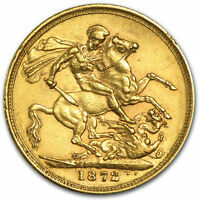 British Gold Sovereign Coin .2354 0z. per coin GOLD IS ON THE MOVE! 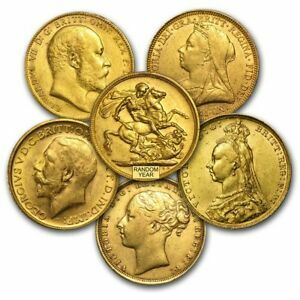 1859 Great Britain Half Sovereign Gold Coin!! apmex has no other items for sale. ONLY $11.99 OVER MELT! LIMITED SUPPLY! *$29 for 12 months. Minimum purchase required. 2017 Taniwha 5 oz Gold Proof Coin, Minted 50 coins, Scarce!!!! 2018 NGC FIJI $50 1oz Gold COCA COLA pr70 FDOI MINTAGE 250 FIRST 1OZ GOLD ever!! ¡ Ultra Rare Gold Coin ! 9-11th Century. Crusader Coin. 1850-A 1 Swiss Franc Switzerland PCGS MS67 SUPER GEM!! Old Holder! Sales tax may apply when shipping to: AL(8.45%), CO(7.0%), CT(6.35%), DC(6.0%), GA(9.0%), HI(4.712%), IL(8.75%), IN(7.0%), IA*, KY(6.0%), LA(11.45%), ME(5.5%), MD(6.0%), MA(6.25%), MI(6.0%), MN*, MS(8.0%), NJ(6.625%), NY(8.875%), ND(8.5%), SC(6.0%), SD(4.5%), UT(4.7%), VT(7.0%), WA*, WV(6.0%), WI(5.6%). Good seller, item as described, excellent service. The GB Sovereigns are so much fun! You can get a coin that is 100+ years old and they have discounts or ebucks on the product frequenty. The coins look great for Avg Circ. You have a chance to get one of the above coins. They are in very good shape and very reasonably priced. Just what I ordered. Excellent BU coins. Both sovereigns weighed in at 0.26 try ounces, a bit higher than promised and very pleased. One was 1877, and the other was 1918.